Eddie Prové is a name everyone will soon be hearing about as the twenty-three year old singer-songwriter’s outstanding talent has begun receiving recognition. After being compared to huge artists including Years & Years as well as Lorde-it’s no surprise that Eddie Prové was chosen (after releasing just one song) to play a BBC Introducing gig. Eddie is also set to play at a number of festivals including Live At Leeds and Are You Listening Festival to show his exceptional and compelling live performances. Eddie has also co-written and produced all of the music from his forthcoming EP Silent Love with Oh Wonder’s Frank Colucci. 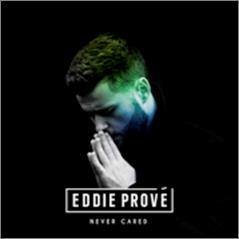 Love For A Day is the forthcoming single from Eddie-with soulful vocals resembling the Grammy Winner Sam Smith. The piece is passionately sung in a falsetto tone, having likeness to music by huge artists such as The Weeknd and Nick Jonas. The production has a euphonious reverb, which is similar to music from Frank Ocean. The piece is on the electronic side of pop, which combined with songwriting related to that of James Blake creates an emotive and distinctive piece. Eddie Prové’s debut EP will be available on Friday 13th May 2016.